Summer has arrived at last, and everyone is eager to enjoy the warm weather, and work in the garden! After all the hard work our vintage garden tin filled with craft baked desserts will be a welcome sight! 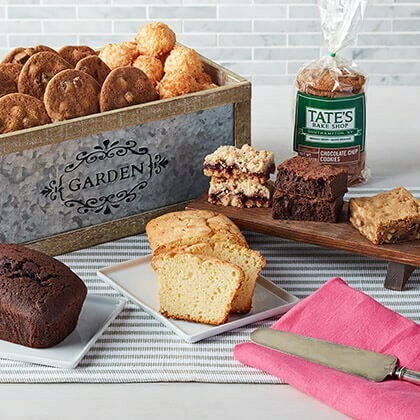 Each tin is packed full with everyone's favorite chocolate chip cookies, coconut macaroons, a yummy assortment of bars, and our moist lemon and chocolate tea loaves. Once the treats are gone this crate is perfect for holding those gorgeous summer blooms!